Dieting is notoriously difficult. Many diets are downright uncomfortable and unsustainable, and they never seem to deliver the meaningful, lasting results you want. But what if you could be healthier and happier with a diet plan that actually works? The ketogenic (keto) diet is a safe, effective way to shed stubborn pounds and increase your energy. Maybe you’ve heard of keto or other low carb, high fat (LCHF) diets before, but you weren’t ready to climb on board the low-carb wagon. We know there’s a lot of information out there, so we created a comprehensive guide that’s easy to follow so you have everything you need to get started. 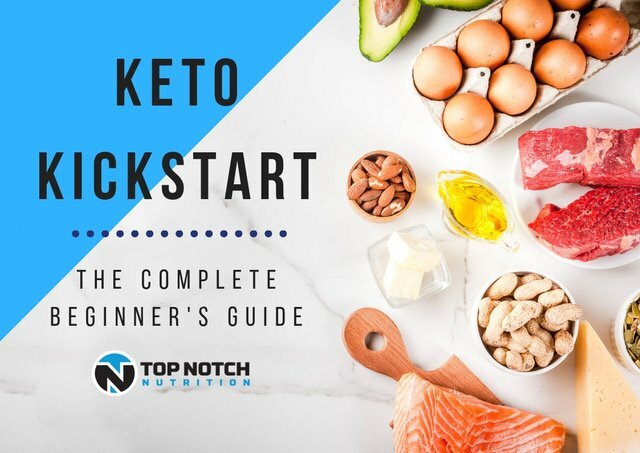 In this guide, you’ll find all of the information, tips, delicious recipes, and meal planning advice you need to go keto, including how it works, when you’ll start noticing changes, and why it’s more than just another fad diet. Chapter 1: What Is the Keto Diet (and How Does It Work)? Chapter 2: How Does a Ketogenic Diet Differ From Similar Diets? Chapter 5: Is the Keto Diet Safe? Chapter 10: What Is Intermittent Fasting? The ketogenic diet is a high-fat, moderate-protein, very low-carbohydrate diet. When you eat something high in carbs, your body produces glucose. Glucose is the easiest molecule for your body to convert and use as energy, so your body uses it first. On a high-carb diet (the typical U.S. diet) your body doesn’t require fat for fuel, so it becomes stored in the body. However, by lowering your carb consumption, your body is forced to find a different energy source. And when your body starts burning fats for fuel (instead of carbs or proteins), it enters into a state known as ketosis. The end goal of a keto diet is to become fat-adapted. Essentially, you’re programming your body to burn fat first! This is done by limiting or even entirely eliminating carbohydrates. The keto diet, on the other hand, focuses on where you’re getting your calories rather than restricting how many you can have. It’s common for the ketogenic diet to get categorized with Atkins, IIFYM, and Paleo. And while there are similarities, it’s important to establish the major differences. The Atkins Diet has an “introductory” phase where, carb intake is set at roughly 15-30 grams per day maximum—similar to the carb allowance on a ketogenic diet. This helps promote fat burning within the body instead of using glycogen for energy. After this introductory phase ends, though, some carbs (albeit a very limited quantity) are reintroduced. The main difference between Atkins and keto is the unlimited amount of protein you can consume on Atkins. One of the primary selling points of Atkins is that you can eat whatever you want as long as it isn’t carbs. This leads to the overeating of low-quality food, which can derail weight loss efforts and lead to health problems. Even people who maintain a healthy diet on Atkins often compensate the low carbs by eating more protein. And when you eat too much protein, your body converts it into glucose to be used for energy, which can stall weight loss. Eating high-fiber, satiating carbohydrates, such as oats, beans, fruits and vegetables. Cutting down on saturated fat and prioritizing unsaturated fats. Eating a variety of colorful fruits and vegetables. Omitting fast food and heavily processed foods. Drinking only purified water to avoid toxins such as chlorine and chloramine. Choosing tea over coffee, particularly the white, green, and oolong varieties. Consuming dark chocolate, defined as 70 percent cocoa content or more. There’s nothing inherently wrong with Weil’s recommendations, and the diet is full of tips about how to eat wholesome foods. But it isn’t a low-carb, high-fat diet… at least not without some modifications. And, it isn’t necessarily geared toward weight loss (though an anti-inflammatory diet has been shown to increase metabolism). It’s geared toward making healthier choices. The paleo diet is similar in this regard. It eliminates dairy, grains, and processed foods, and dieters are encouraged to balance their macronutrients (fat, carbs, and protein) any way they want. Paleo doesn’t require counting calories, which is part of what attracts so many folks to this diet—you can eat as much as you want! It’s all about eating the “right” food. The idea behind paleo is pretty simple, and it goes back to the time when we were still hunting and gathering. Although human beings have walked the planet for some time, our bodies and dietary needs haven’t changed much since the first humans walked the earth. So, why is the average human these days overweight, stressed out, and out of shape? Well, this little thing called agriculture created mass food sources. Since then, we’ve been dependent on grains—bread, pasta, rice, and corn. The paleo diet is an attempt to go back to our roots by consuming foods we’re biologically designed to eat, like grass-fed meats, seafood, fresh fruits and vegetables. This means cutting out grains, sugar, and processed foods. Most paleo folks also shy away from dairy. Why? No other animal drinks milk after infancy, and many paleo dieters take pride in “returning” to the animal kingdom. Paleo is often referred to as the “gluten free diet.” And although the diet can have many health benefits, there are also significant drawbacks. When your body is no longer exposed to gluten, it can become gluten intolerant. There are also valuable nutrients in milk, like vitamin D, that can be hard to replace without a strategic diet plan. Although most other diets are keen on improving health, it’s done by limiting food intake and creating a healthier balance of foods. Keto is different. Other diets don’t rely on an age-old natural process to completely retrain the way your body burns fuel. What separates keto from all of these diets is that it incorporates high levels of healthy fats that reprogram your body to burn fat first (even when you aren’t working out). By eating very specific food groups – fats, moderate protein, and little to no carbs, you zap your body into ketosis. Now, your body is burning ketones instead of glucose. Keto is a fast-acting, fat burning solution that can help you lose weight, increase energy, and improve mental focus. Regardless of your diet goals, it’s always a good idea to speak with your doctor before starting a new diet. Depending on your unique health needs, your doctor or nutritionist can direct you to the keto diet plan (or a modified keto diet) that’s best for you. The standard keto diet is the most common and best option for most people. The backbone of this regimen is straightforward: eat as little carbs as possible. Carbs are the enemy. In this standard keto diet, you eat little to no carbs, moderate protein, and lots of good fats. We’ll talk more about healthy fats later in the article. According to the targeted approach, you stick to a keto diet most of the time, but eat carbs 30-60 minutes before a period of intense exercise. The targeted keto diet approach is ideal for beginner or moderate strength trainers, as well as anyone who cannot use the ickic ketogenic diet for health reasons. That does NOT mean you should default to a targeted or cyclic keto diet just because you exercise on a regular basis. It really depends on your preference as well as the type and intensity of exercise you’re doing. “Carbo-loading,” as it’s sometimes called, can give you a boost of energy, but it will temporarily pull your body out of ketosis. If you do choose a targeted keto diet, stick to easily digestible carbs (like those found in fruits, white bread, veggies, or cereal) so they’re used up completely without disrupting ketosis for very long. Post-exercise keto diet meals should be high in protein rather than high in fat. Higher protein immediately after exercise helps support nutrient absorption and muscle recovery. Like the TKD, the cyclical keto diet is perfect for bodybuilders and athletes. With a cyclical diet, you alternate days of ketogenic dieting with days of high-carb consumption. The goal is to maximize fat-loss while also building lean mass. Building mass and taking yourself out of ketosis more frequently means a cyclical diet won’t be right for most dieters. So, for the rest of this post, we’ll be focusing primarily on the standard ketogenic diet. And if you want to learn more about how to modify a keto diet to fit your exercise routine, check out our Keto Recipe Tips for Beginners. Many people believe eating a keto diet means eating lots of meat, eggs, and dairy. And if you are lactose intolerant or struggle with a dairy allergy or sensitivity, you may think keto isn’t an option. Alternately, you may be excluding dairy from your diet to speed up weight loss. It’s a classic weight loss trick that comes with celebrity approval. Khloe Kardashian, among others, believes that cutting dairy is the key to the skinny life. Whatever reason you have for cutting dairy from your diet, it’s actually easier than many dieters think to turn a standard keto diet plan into a delicious, dairy-free ketogenic menu. Here are a few options to consider instead of dairy. Milk isn’t recommended on keto (too many milk sugars). Instead of milk, try coconut milk, almond milk, soy milk, or cashew milk. Instead of cheese, you can try non-dairy cheese. Smoked tofu can also mimic mozzarella. And nutritional yeast is a simple ingredient that offers a cheesy vibe and texture to food. Instead of heavy cream, try avocado oil or coconut cream. We don’t recommend that you cut dairy completely unless you are lactose intolerant. Although dairy contains milk sugar and protein that can interfere with ketosis in high quantities, it’s also a powerhouse of vitamins, calcium, and healthy fat. If you do want or need to remove dairy from your diet, we suggest using a tracking app to make sure you’re getting the nutrients you need from dairy substitutes. Still trying to decide which keto diet plan is right for you? For most people, the standard keto diet will be the best fit. The SKD also comes with the most research and ready-to-use food plans backing it up. If you follow the regimen correctly, the SKD is all but guaranteed to help you become keto-adapted. As always, what works for you may not work for others. Listen to what your body is trying to tell you. And, it’s best to consult a health care professional if you have specific concerns. Many people are raving about the keto diet. Actress Melissa McCarthy used a low carb, high fat diet (and a new workout regimen) to lose 75 pounds. But the benefits extend far beyond just losing weight! Low-Carb Diets Are Filling (and Reduce Cravings)! The worst part of dieting is feeling hungry. It’s the reason many people give up on a diet (or the idea of dieting in general). But the right diet doesn’t have to restrict total calories or limit how much you can eat. The great thing about keto is that it leads to natural appetite reduction. Studies show that cutting carbs and eating more fat actually decreases appetite and cravings, so you can feel satisfied and eat fewer calories without even trying. Ok, so this one’s obvious. But let’s talk a bit more about why so many people have greater success losing weight on a ketogenic diet than standard diets (often low fat). The traditional way to lose weight is to decrease caloric intake and increase physical activity. It’s a simple equation: burn more than you take in. So, why doesn’t it work for so many? The main problem with restricting calories is hunger. When you just restrict calories, your body doesn’t have the energy it needs to adapt to minor (or major) changes. Many diets also fail to eliminate food cravings, so you feel deprived instead of satisfied. By re-training your body to burn fat for fuel, you can lose weight without restricting total calories. There’s a considerable amount of research that indicates cutting carbs is a faster, safer path to weight loss than cutting fats or simply restricting calories. The primary reason being that a low-carb, high-fat diet is a lifestyle, NOT a short-term diet. The keto diet reduces blood sugar. How? First, let’s understand that carbs are sugar. When we eat carbs, they are broken down into glucose (a simple sugar) in the digestive track. From there, they enter the bloodstream and elevate blood sugar levels. High blood sugar is actually toxic. The body responds to spikes in blood sugar (like those that occur after eating many carbs) by producing insulin. Insulin is a hormone that helps lower blood sugar and balance blood glucose levels. It also tells your body whether to burn or store the energy you just consumed. If you’re consuming lots of sugars, then your body doesn’t need to rely on other energy sources, like fat. By cutting carbohydrates, you naturally lower your blood sugar levels and reduce (or eliminate) insulin spikes. This is especially good news for diabetics who struggle with elevated insulin levels. Ketogenic diet foods are extremely energizing. When your body learns to burn fat for fuel, you open up a much larger energy reserve. Your body can continue to burn fats between meals and workouts, increasing total energy and keeping energy levels more consistent throughout the day.. Athletes like Lebron James have made the change to a low-carb diet as a way to increase stamina and improve overall body composition. And, military researchers believe that soldiers could operate optimally on fewer, denser meals. Currently, the Defense Advanced Research Projects Agency, the Department of Defense, and NASA are all running ketogenic experiments. NASA believes the diet will be important in manned missions to Mars because it protects against higher levels of radiation in space by increasing the brain’s resilience to stress. In the 1920s, the keto diet has been used to treat epilepsy in children. It is still recommended to children who don’t respond well to medication. The keto-epilepsy link has a long history and extensive research to support its effectiveness. But why is keto good for your brain? As your body ages, it’s more difficult for your brain to use glucose as energy. Ketones, however, are easier for the brain to process. They help curb the stress response in neurons and make them more resilient, which is particularly helpful in treating seizures. There is also evidence that neuroprotective properties benefit from the keto diet. It is said to increase the number of mitochondria (energy producers) in brain cells. Because of this, there is a growing body of research that indicates keto can help reduce brain disorders, like Alzheimer’s and Parkinson’s. We won’t get too into the technical neuro jargon, but it is amazing how this diet affects more than just your weight, but also neuro functioning and mood. Ketones are a neuroprotective antioxidant, and a more efficient energy source than sugar. And because brain cells tend to lose their ability to use glucose efficiently as fuel over time, burning ketones may be an essential part of maintaining the health of aging brain cells. Ketones have also been found to trigger increased levels of the protein BDNF in ways that can improve the function of the hippocampus, cortex, and basal forebrain—areas of the brain vital to learning, memory, and higher thinking. More research is needed into keto’s ability to fight cancer, but the initial results are promising. Leading Boston College cancer researcher Thomas Seyfried, M.D., believes that a ketogenic diet is therapeutically even more valuable in fighting cancer than chemo. D’Agostino, Ph.D. and associate professor at University of San Francisco, has published research showing that ketogenic diets can double the lifespan of mice with metastatic cancers. The role of fasting in weight loss and the treatment of diseases has been known for thousands of years, and it was studied in detail by ancient Greek and Indian physicians. In the States, we’ve been studying the effects of keto since the 1920s when it was first used to treat epilepsy in children. There is a large (and growing) amount of research that supports the safety and effectiveness of keto. However, there are some potential drawbacks. First, you need to adhere closely to the program for it to work. And, every individual is different and will react differently. As a precaution, you should check with your physician if you have any concerns about starting the keto diet. You should especially be wary if you’re struggling with disordered eating or currently taking medications for a pre-existing condition. In these cases, additional monitoring may be needed. Who Should Be Cautious of Starting a Keto Diet? Transitioning into a keto diet increases stress on your body for the first 3-4 weeks (as you’re becoming fat-adapted). It affects hormone, insulin, blood sugar, and energy levels, and the significant changes aren’t right for everyone. In general, the keto diet is safe. However, if you fall into one of the following categories, we recommend reaching out to a physician for additional guidance tailored to your needs. It takes time for the body to become fully fat adapted, so it important for athletes not to try this transition if they are in season or about to start a season. We also highly recommend working alongside a professional if you’re struggling with an eating disorder. Anorexics already have limited their calories and may suffer from rapid starvation with an unmonitored ketogenic diet. With that being said, many people with eating disorders have begun to form a healthier relationship with food through the keto approach. The keto diet can contribute to overall well-being. The important thing is that you get the proper ratio of macros. Macros, or macronutrients, are your daily intake of “the big 3” nutrients: fats, protein, and carbohydrates. All three can provide energy, and each has a different effect on ketosis. Fats are somewhat the end all be all of the keto diet. On this diet, you eat fat. That’s the bottom line. Proteins are partially keto friendly. Although protein is allowed on keto, it should be limited to moderate levels. There is a misconception that the ketogenic diet is a high-protein diet. It’s not. While Atkins allows you to eat as much protein as you want, keto acknowledges that too much protein can pull you out of ketosis and make it harder to lose weight. Too little protein, on the other hand, may cause muscle loss and increased appetite. Carbohydrates will need to be restricted on your keto diet. All processed carbs & sugars have got to go! Restricting carbs is a must. Limiting protein is also important (don’t replace cut carbs with protein). The ketogenic diet is high in fat, moderate in protein, and very low in carbs. Although keto is known as a “high fat” diet, some fats are better than others. There are four types of fat you should be aware of. Saturated fats are fine on a keto diet. These are the fats you find in butter, coconut oil, whole milk, and red meat. You may have heard that all saturated fats are bad for you, or that high levels of saturated fat have been linked to increases in LDL cholesterol, but that isn’t always the case. What’s important is considering the different sources of saturated fat. When you get saturated fat from healthy sources, like coconuts and grass-fed beef, this actually results in healthier cholesterol that isn’t associated with increased risk of heart disease. Monounsaturated fats are great on a keto diet! You can get monounsaturated fats from olive oil, avocados, and many nuts and nut oils. Monounsaturated fats are a great way to replace or supplement saturated fat without raising harmful cholesterol. Trans fats are the worst! They’re a byproduct of the process that turns healthy oils into solids with longer shelf lives, and they’ve been linked to a variety of health problems, including high cholesterol, heart disease, stroke, diabetes, and other chronic conditions. Thankfully, trans fats are becoming less and less common in the food supply and they’re easy to avoid on a keto diet plan. Omega-3 and omega-6 essential fatty acids are important components of cell membranes. They are help regulate your blood pressure and inflammatory responses. Eating fish or taking a fish oil supplement can keep your omega 3s balanced. And, nuts and seeds are a great source of omega-6s. We’ll get into healthy, keto-friendly foods you can eat to increase fat intake later in the article. First, let’s talk about how to track your macros, carbs, and ketones. Now that you understand what macros are and what ratio you need, the question becomes: how do you strike the right balance? In order to track effectively, it’s beneficial to identify your goals. Do you want to lose weight, look better, fit into your high school jeans, build muscle, or just be healthier in general? Any goal is great as long as it’s clearly defined. The easiest way to track macros is through a keto calculator. You can customize every aspect of the calculator for your goals, your activity level, and how much you want to eat. It’s easy to use and is customizable for your specific body. Net carbs are often different from the carb count you see on their nutrition labels. And knowing the difference between grams of carbs and total net carbs is a very important concept for all low carb diets. On a low-carb, high-fat diet, you should be tracking net carbs. Fiber is a non-digestible carbohydrate. It doesn’t raise blood sugar levels or trigger an insulin response, and it doesn’t count toward your total carb consumption. That means you can reintroduce some medium or high-carb foods back into your diet that you may have thought were off-limits: almonds, for example, have 20g of carbohydrates, but 11g of those are from non-digestible fiber. So, how many carbs should you consume on a keto diet? 50g of total carbs (20-35g of net carbs) a day is enough to induce nutritional ketosis in most dieters. Some dieters eat a semi-ketogenic diet that includes 100g or more of carbs. But you can easily fall out of ketosis if you consume too many carbs, reducing or even eliminating many of the benefits of a ketogenic diet. Speaking of ketosis: how can you get there? And how will you know when you’re in ketosis? The keto diet is all about becoming fat-adapted. When you reach ketosis, your body starts converting fat into ketones to burn as fuel. Being in ketosis and being fat-adapted are NOT the same thing. But, getting to ketosis (and staying there) is how you become fat-adapted. So, let’s look at some of the signs that your body is burning fat for fuel and how you can tell the difference between burning fat and being fat-adapted. Ketosis is a natural state for our bodies to be in, but it may be a significant change from your previous diet. And, the first month on a keto diet can be more challenging as your body adapts and you manage any temporary side-effects. Remember, there’s a difference between being in ketosis and being fat-adapted. Some people can fast for 12 hours and wake up in ketosis. That does not mean they are fat- adapted. Ketosis just means that your body is producing ketones. It typically takes a person 2-3 weeks of being in ketosis to become fully fat-adapted. When you’re fat-adapted, your body always has a ready source of concentrated energy. This helps reduce cravings, and allows you to feel physically full and satisfied longer (and while eating less). The cravings you do have will shift toward filling, high-fat foods instead of high-sugar, high-starch foods that are notoriously hard to stop eating. When you wake up craving eggs and bacon instead of a bagel, muffin, or Pop Tart, your keto diet is going well. When your body is fat-adapted, you aren’t relying on short bursts and small stores of carbs for energy. That means you can maintain higher energy levels throughout the day. By tapping into a new, more readily available fuel source (fat), you can experience smaller fitness plateaus. You also retain glycogen stores in the liver and muscles that give your body a reliable energy reserve during intense workouts or training periods. Of course, you won’t become fully fat-adapted overnight. But stick to it! It’s after the first 2-3 weeks of dieting when you’ll really notice and enjoy the results and benefits of keto. One of the surest ways to know if you’re in ketosis is to test ketone levels. You can use urine strips, a breath ketone analyzer, or a blood ketone meter, and each offers its benefits. A breath ketone analyzer offers an easy-to-use (and reusable) test you only need to purchase once. But, it can be less accurate than other tests, and it actually takes longer than blood or urine tests to provide a result. The high up-front cost can be intimidating, as well, especially if you aren’t sure you want to commit to the keto diet. Urine strips are the cheapest testing option, and they can be more accurate than breath ketone analyzers (though not as accurate as blood testing). The one drawback is that they can be less accurate once you’re fully keto-adapted. A blood ketone meter is the most accurate method for measuring ketone levels (both before and after you become keto-adapted). But, it can also quickly become the most expensive. Just 2-3 blood ketone tests can cost as much as 100 or more urine test strips. And, the blood ketone meter requires a small prick of the finger to draw a drop of blood, which can make some people uncomfortable. We recommend ketone testing 2-3 times a day. Your ketone levels will change throughout the day, and a single test may not give you an accurate picture of how well you are doing on the keto diet. If you aren’t seeing the results you want in your testing (you aren’t in ketosis), you can try intermittent fasting as a quick way to get into ketosis. Intermittent fasting sounds intimidating, but it’s surprisingly simple. You’ve probably done it before (and recently) without even realizing it! There are different types of intermittent fasting, but the most common involves only eating within a certain window of time each day. For example, you only eat between 12pm and 6pm each day, giving you a 6-hour “feeding” window. That window can be shrunk or expanded depending on your needs and preferences: typically somewhere between 4-7 consecutive hours of the day. One of the biggest reasons people turn to intermittent fasting is for weight loss. That’s because our bodies can only comfortably take in a certain amount of calories at once. By limiting your intake window (and eliminating unnecessary snacking), you naturally limit total daily caloric intake. Intermittent fasting also activates a process known as autophagy in the body: a phenomenon where it “eats” its own cells and tissues—in a good way! Autophagy helps the body “clean house,” removing harmful and toxic compounds and recycling damaged proteins. Make sure you still eat enough. How much you eat is going to vary depending on your age, height, gender, body fat percentage, physical activity, and weight loss goals. To make sure you’re getting enough calories and nutrients while fasting, enter each of these factors into a ketogenic calculator. Your energy, focus, and overall wellbeing are going to suffer if you aren’t eating enough. By testing ketones 2-3 times a day, you can see how your body is reacting to intermittent fasting and whether it’s delivering the results you want. Intermittent fasting is not a necessary part of eating a ketogenic diet, but it is a fast, effective way to reach ketosis quickly! Whether or not you use intermittent fasting as part of your weight loss strategy, you may experience a handful of side-effects as your body becomes fat-adapted. Don’t worry—these are temporary and can often be reduced or eliminated with a few small changes to your diet. To test your ketone levels, get your strips here. By far the most common side effect is called the keto flu, or induction flu. It can hit hard for 2-3 days after starting keto, but side effects rapidly subside as your body adapts and you start burning more fat. Within a week, they are usually gone. Why do people get keto flu? Carbohydrate-rich foods may increase water retention in your body. So when you stop eating high-carb foods on a keto diet, you lose excess water and salt through your kidneys. This causes you to urinate more frequently and can result in dehydration and a lack of salt during the first week while your body has adapts. You can minimize keto flu (or even eliminate it) by drinking more fluids and by temporarily increasing your salt intake. A good option is to drink a cup of bouillon/broth 1-2 times a day. It’s common for low-carb diets to cause bad breath. It’s one of the ways your body expels ketones, and it’s a sign that you’re in ketosis. Unfortunately, keto breath has been described as fruity, like the smell of rotten apples. The good news is that you can fight keto breath the same way you would fight any bad breath. And try not to worry. Keto breath should fade as you adapt to the diet. Stay hydrated. One of the biggest drivers of bad keto breath is dry mouth. Use a natural mouthwash and breath freshener. Keto rash is an itch on your chest, torso, back, or neck. It tends to appear in areas where sweat accumulates, like your armpits, and it generally only occurs during the initial stages of ketosis. While the rash can be uncomfortable, there’s no reason to be alarmed. If the rash becomes severe enough to interfere with your sleep or daily life, your doctor should be able to provide a lotion to get past the temporary discomfort. It can take four or more weeks to fully adapt to the keto diet. Knowing what to expect can make the transition easier and less stressful. All transitions are hard. So, it’s best to keep this one as easy as possible. Taking away carbs will take some getting used to, and trying to do too much too fast could leave you frustrated and make it harder to stick to your new diet. So what can you do to make keto easier in the first week? Plan meals, do meal prep, and make enough for leftovers. This allows you to grab pre-made food out of the fridge as you head out the door. With delicious, healthy meal options ready to go, you can satisfy your hunger and food cravings without cheating on your diet. This first week is also when you’re most likely to experience many signs and symptoms of ketosis, so make sure that you’re drinking plenty of water and getting plenty of salt. You should also avoid dessert for the first two weeks. Remember: sugar is the enemy. Wow, week 1 is over! It’s like you’re a pro now, right? Keep things simple again this week. Take the same approach as week 1, but start looking for small additions and substitutions you can make to feel even better and further reduce cravings. Try switching to fat fueled coffee, for example. It’s a mixture of coconut oil, butter, and heavy cream in your coffee that works with the keto diet to keep you full and energized longer. And it tastes great! Don’t knock it ‘til you try it! Remember to avoid desserts again this week. Even natural sugars like those found in fruits can pull you out of ketosis and slow down your progress. Ok. NOW you’re a pro. NOW you’re ready to fast. When you’re in ketosis (and you should be in ketosis by now), your body mimics a fasting state. By introducing intermittent fasting, your body is able to burn fat at a MUCH faster rate. Don’t worry if you can’t stick to intermittent fasting. Instead of eating during one block of time each day, try eating larger meals at breakfast and dinner and fasting in between. And remember: fasting is optional on a keto diet. We recommend it here as a way to accelerate the process of becoming keto-adapted, but it isn’t necessary. You can eat as much as you want as long as it fits into your macros. Whether or not you incorporate intermittent fasting, week 3 is where the keto menu really opens up and meals get more fun! With two weeks of keto eating under your belt and keto-flu far behind you, you can focus on creating a delicious meal plan that you’re excited to eat. And guess what: you get to eat desserts again! And there are dozens of mouth-watering keto-friendly desserts you can make at home. Woo! You are a keto master. And like any guru, your practice becomes stricter with maturity. This week, you’re going to skip breakfast and lunch. Again, fasting is optional. But, by helping your body reach and stay in ketosis during this first month of the keto diet, you can get past uncomfortable side-effects and become fat-adapted faster. If skipping two meals a day seems like a lot, you’re not alone. Here a few tips to help. Water is your BEST friend! And don’t forget that you can drink coffee, tea, and flavored water to get your liquids in—as long as they don’t contain sugars. Fat fueled coffee is especially helpful here. Plan nutritious, filling dinners you’re excited about. Fasting is easier if you know you have a big, delicious meal to look forward to (and one that will leave you full and satisfied for hours). You’ll also need to make sure you’re getting all of the day’s nutrients during dinner hours, which means having a variety of entrees, sides, and sauces. We talked a lot about fasting as a way to accelerate weight loss on a keto diet, but it isn’t the only way to get more off your belly. As with any diet, adding exercise to your routine can help you see greater results, faster. Since keto means cutting carbs, and carbs are the first thing your body burns during exercise, you may be wondering about your exercise options while in ketosis. In most cases, you should avoid changing your exercise routine until after you’re keto-adapted. The changes you want to focus on during the first four weeks are those in your diet. If you already have an exercise routine in place, try to stick to it. You may notice a brief drop in energy during the first four weeks, but don’t worry! It’s only temporary. And after the initial adapting period, many athletes report increased stamina and performance. Your body’s nutritional needs vary depending on the type of exercise performed. Doing 20 minutes of cardio and 20 minutes of strength training won’t burn calories at the same rate or affect your body in the same way. Are you trying to lose weight or build lean mass? There are four different types of exercise, and each one affects your diet plan differently. Aerobic exercise is also known as cardio. Any movement that lasts over three minutes is considered aerobic exercise. Anaerobic exercise is characterized by shorter bursts of energy. Think weight training, sprinting, or other types of interval training. For anaerobic exercise, carbs are the main fuel source. Fat alone doesn’t provide enough energy for this type of workout, which is why many bodybuilders and athletes use a targeted or cyclic keto diet. Flexibility and balance are unaffected by the keto diet, and you can perform your yoga routine as usual. Low-intensity aerobic exercise, like going for a walk or taking a leisurely bike ride, is great for keto. In this type of exercise, the body uses fat as its primary energy source. During high-intensity aerobic exercise, however, like running or swimming, carbohydrates are the main energy source. When you’re in ketosis, fat is used as the primary fuel source, which can make high-intensity, anaerobic exercise more difficult during the first few weeks of a the diet (before you’re fully fat-adapted). If you work out more than three days a week and at high intensity (sprinting, weightlifting, kickboxing) and you don’t have enough energy to get through your workouts, try switching to a targeted keto diet. By eating 15-30 grams of easy to process carbs 30 minutes before your workout, you provide your muscles with the energy they need to perform and recover. And because you’re limiting the amount and type of carbs, you can use them all up quickly so you don’t stay out of ketosis for long. Regardless of your exercise routine, the most important aspect of a keto diet is keeping a close watch on the food you eat. Below we get into the nitty gritty of how to plan nutritious and delicious keto diet meals, including what foods you should buy and which ones to avoid. Knowing what to eat on a ketogenic diet can help you get started quickly and easily. And, having a list of keto-friendly foods and recipes you love (and substitutes for your favorite high-carb foods), can make going keto downright enjoyable. How much you should eat depends on your weight loss goals and body type. For now, try to focus on what you’re eating, not how much. We break down our list of keto-friendly foods by category to help you quickly build your shopping list each week. And take an extra few seconds to check the label (or a handy carb app like Low Carb Diet) to ensure what you’re eating is within keto range. While almost any meat is going to be fine on the ketogenic diet, you’ll want to avoid processed meats like sausage and lunch meat. Not only are they higher in unhealthy fats, but some have added flavors and seasonings that include carbs and sugars. If possible, grab uncured items (grass-fed beef and wild-caught fish are especially healthy choices). Many meats are high in protein, so stick to fattier cuts of meat to keep your macros balanced and yourself in ketosis. Most people are surprised to find that some fruits and vegetables are high in carbs. While some diet sites say to avoid fruits and veggies entirely, there are actually quite a few options you can incorporate into a keto diet. The options below have low net carbohydrates and are a great source of vitamins and healthy fiber. While milk isn’t recommended on the ketogenic diet, you will find full-fat cheeses and dairy on this plan. These items are all keto-friendly (but you should always double-check carb counts on the packaging as no two brands are alike). While the ketogenic diet is high-fat, that doesn’t mean all fats are equally good for you. The following high-fat foods offer tasty ways to get the fat calories you need. These are the things that just make the plan easier to manage. While snacking isn’t really recommended, we all have moments when need a little something to tie us over. These are also items that help you with cooking, adding flavor, and bulking up meals. Below are items to keep on hand in your pantry for many reasons. Every meal is better with the right condiment or sauce. Thankfully, many of your favorite condiments an toppers are fair game on a ketogenic diet. Many of you are probably wondering: can I drink alcohol on this diet? Your best bet to keep carbs low is to stick to clear liquors. If alcohol tastes sweet, it probably isn’t keto. Check out the total alcohol guide on a low carb diet. The goal is to avoid carbs, right? But some high-carb foods are actually high in fiber and low in net carbs. There are also proteins, beverages, and fats you’ll want to avoid if you want to stay fat-adapted. We break these down below. Cutting out fruit is one of the changes that most surprises keto beginners. After all, fruit is supposed to be healthy, right? It is. But fruit is also high in sugar, making most fruits not entirely keto-friendly. If you love fruit and its health benefits, stick to lower-sugar options, like blueberries, blackberries, and raspberries. Try to eat these sparingly. Eating too much protein is one of the biggest mistakes people make on a keto diet. Unlike other low-carb diets (like Atkins), you can’t replace lost carb calories with protein, as too much protein will pull you out of ketosis. You will want to avoid protein sources that are high in carbohydrates, like beans and lentils. You’ll also want to avoid factory farmed animal products, like processed, packaged meats. You should steer clear of low-fat milk and reduced-fat dairy. High fat dairy products, however, like yogurt, butter, heavy cream, and sour cream are all great keto diet menu options. Raw milk is also okay in small amounts. However, it’s always important to account for the carbs, as low carb is the pillar of the keto diet. Factory-farmed fish and pork products. These are high in inflammatory omega-6 fatty acids. Avoid processed meats (hot dogs, packaged sausages, lunch meats). These often contain preservatives that could be harmful to your health. It’s best to stay clear of most caloric and sweetened drinks—like soda and most juices—as they are often full of carbs. Although you can consume alcohol on this diet, you want to steer clear of most beers and sweet wines, which are higher in sugar and carbs. If you’re looking for keto meal ideas, there are plenty of great resources out there! We’ve included a few recipes to get you started! Find example Keto Breakfast meals here. Find example Keto Lunch meals here. Find example Keto Dinner meals here. Although we don’t necessarily recommend snacking on a keto diet (especially when you’re fasting), there are some keto-friendly snacks that are to die for! These tasty low-carb treats can add a little flavor (and fat) to your daily diet. Fat bombs might look a lot like energy balls, but they’re actually high in fat from nut butters and seeds while staying low in sugars. The result is an energizing, super filling snack you can use when you’re hungry or if you’re struggling to eat enough fat in your diet. This one is easy enough to do: Just keep a bunch in your fridge. They provide protein and fat, which is perfect! Walnuts are high in fat, have a moderate amount of protein, and are low-carb. Yes, steak—or, to be more specific—steak bites, can totally be an awesome (and supremely satisfying) keto diet snack. Sunflower seeds are an awesome source of healthy fat and fiber! What? That’s right! Zucchini is a great vegetable for keto fans because it’s low in carbs and it works as a substitute for many high carb ingredients. Avocados are packed with healthy monounsaturated fatty acids, along with plenty of other minerals like fiber and potassium—all with a lower carb count. Missing sandwiches? Try serving them on a skewer or kabob. Spear a small piece of ham or chicken, a little cube of cheese, and some tomato or bell pepper, and you’ve got a bite-sized “sandwich” without the grains. Click here for more keto snack options. Grocery shopping on a budget can be a fun and satisfying adventure! How many of us have gone to the grocery store with the intention of saving money, but we don’t make a good shopping list, so we spend too much on impulse purchases and food we don’t need. The first thing you’re going to want to do is hunt down the deals on keto-friendly foods. You’ll be able to find some good deals at just about every local grocery store. Knowing what’s on sale allows you to adjust your meal plan. Meal prepping is the secret to eating on a tight budget. It allows you to buy the items that are on sale, in bulk, and easy to prepare. This allows quick access throughout the week and allows you to put leftovers (and extra ingredients) to immediate use. The great thing about the keto diet is that veggies and certain kinds of proteins, like chicken and eggs, are very inexpensive. If you’re interested in going keto, cost shouldn’t get in your way! We think the low-carb, high-fat keto diet is one of the best ways to burn fat and increase concentration and energy. Celebrities including Halle Berry, Kourtney & Kim Kardashian, LeBron James, Melissa McCarthy, Joe Rogan, Drew Carey, Megan Fox, Vanessa Hudgens, and many more swear by the Keto Diet, because it really works. Some notable Doctors that are also huge on endorsing the Keto Diet are Dr. Mark Hyman, Dr. Axe, Dr. Dom D’Agostino – just to name a few. When your body is able to utilize a natural process to burn fat instead of carbs, it’s possible to burn off stubborn fat and reach your weight loss goals. And, the best part is that keto meal choices are fantastic! In this diet, you really do have a lot of freedom in what you can eat, making it easier to stick to the plan and reap real results. We hope this guide gave you all the information you need to get started. If you still feel a little overwhelmed, check out our Keto Recipe Tips for Beginners. Or look through our keto recipes, shopping list, and sample meal plan.